You can never tell when an accident or emergency will cause the grid to go down. That’s why it pays to have a back-up power source on hand. For substantial power needs, turn to Point Zero Energy’s heavy-duty solar generators. The HomeGrid 5000HD comes in four power sizes to suite individual power needs. Will run small kitchen appliances and power tools. Our solar generators sport superior capacities that can power your home and business. 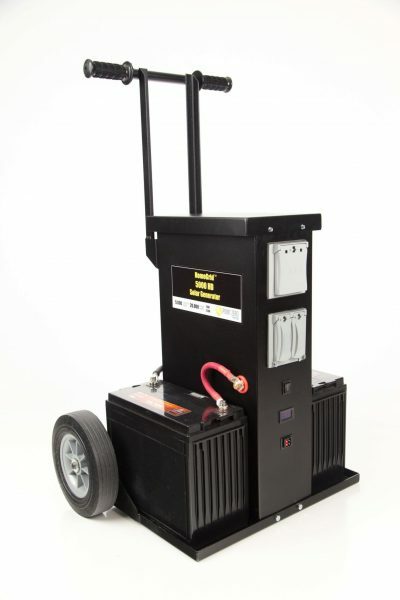 Ranging from 1,800 wh to 12,600 wh, the solar generators can power lights, electrical appliances, power tools, and more. Our team also designed them with portability in mind. If you have any inquiries, don’t hesitate to reach out to our team. We’d be happy to walk you through our alternative energy source products. "In doing extensive research in my quest for a good quality well-built affordable portable solar generator, I came across Point Zero Energy. I was looking for something that was simple to install, easy to move around and powerful enough to run the things I wanted to run should the grid go down. I can’t tell you how happy I am with the product I purchased, the HomeGrid 5000HD. The simplicity yet ruggedness of this product is unmatched. Point Zero Energy is fantastic at customer service as well answering the many questions I had as a relatively new-comer to this field. I’ve used the system and it delivers!" What kind of inverter does this have and how much power does it produce? The 5000HD comes with a Pure Sine Wave inverter. The inverter is rated at 5,000 watts continuous watts and 20,000 surge watts. On average, how long do these batteries last? Under normal use, the batteries will last 8-10 years on the Ultimate and Extreme versions, and 3 to 5 years on the standard version. What differences, besides additional batteries and solar panels, on the Extreme and Ultimate as compared to Standard. The batteries on the Extreme and Ultimate edition are also a longer lasting battery than what comes on the standard. Does the system include indicators which would show the battery charge level, or an automatic shutoff when the charge level drops too low? Yes, it has a battery level indicator, as well as an automatic shutoff when the level gets too low. Will this power a 1.5 HP 230V deep well pump? Yes, this can power a 1.5 HP 230V deep well pump. Can the standard configuration on this generator be modified to replace the 240v plug with at least one nema l14-30 female plug? Yes, that would not be a problem. It could be replaced with a 240V or 120V nema l14-30 female plug. However, delivery time would be delayed a few days to allow us to make the modification for you. How many batteries and solar panels can be added to this system? There really is no limit. I have mine connected to 40,000 watt hours of batteries and 5,000 watts of solar. With this I can run my entire home off grid. However, once you go over 1400 watts of solar, you will have to add another charge controller (or charge controllers depending on the size, and number of panels) for the extra panels. Are solar panels included in this sytem? Yes, any size of the 5000HD come with portable solar panels and batteries. They are a complete system. Yes, this is portable. However, because of it’s size and weight we recommend using more than one person if you need to lift it in a truck. Inverter Idle power consumption in watts?